Created by John Lister, and featured in Health Emergency issue 72. 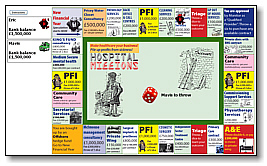 The pre-ACO version of our interactive Board game of investment and shameless speculation is fun and education online for up to four players. Make sure the sound is switched on!